I just wanted to e mail to say how thrilled I am with the results that are appearing with me. 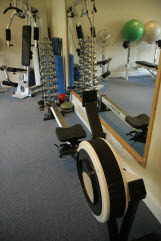 We completed 13 sessions of 1 hr each session, on arriving at the studio the clock is ticking for the fantastic care and attention to each exercise whether it be on a machine or floor work. You recommended a ‘polar heart rate monitor’ which allows you to know exactly how my heart is dealing with the exercise. I have worked with ‘personal trainers’ before but never have I experienced such excellent care and attention. I feel so safe in your hands, it really was my lucky day when I read your advertisement and phoned you. I am so grateful and I intend to work with you for as long as it takes to achieve our goals, many thanks Anne. Current Offer: Buy One Get One FREE! Buy a Block of Training Sessions & Bring Someone Else Along For Free!